The backbone of your dashboards is your data, and in Target Dashboard we have tried to make it as easy as possible for you to insert and update your data. There are a number of ways that you can enter your data into Target Dashboard, ranging from simple manual entry to an import directly from Google Analytics. With some of our automated services, you can tell Target Dashboard to collect your data from a source periodically, or you can update it manually at your convenience. We want to ensure that your charts are as up to date as you need them to be, whenever you need them, and that all begins with the data. Below I will explain some of the ways in which you can enter and update your data in Target Dashboard. 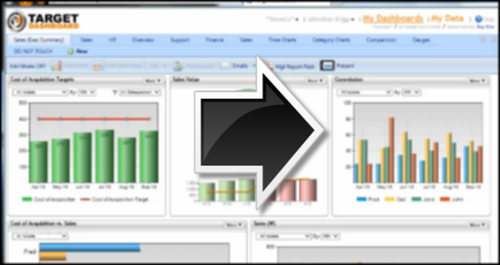 The most basic way of entering data into Target Dashboard is by manual entry. To create a new table, select “Add New Table” from the My Data section, select either of the options below and follow the instructions on screen. If you want to edit your table later on, you can do this from the main table view. 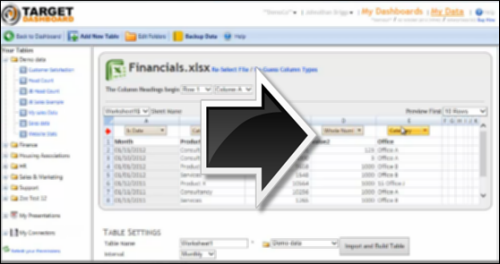 You can add new rows, paste in data from Excel, or update existing rows simply by clicking on them. And that’s all there is to it. You can now move on to creating charts and visuals on your dashboard from your data. Most companies keep data in Excel to some extent, whether it’s sales data, HR statistics or support data. In Target Dashboard you can import an Excel file in just a few minutes. Again, go to “Add New Table” again, but this time, click on the option to Import from Excel instead. Simply upload your file and follow the on screen instructions. Once you have your data in a Target Dashboard data table you can update your data either by pasting it in from Excel, or by adding rows manually. If you prefer to work on your data in Excel, you can keep doing this with Target Dashboard. If you connect Target Dashboard to your Dropbox account you can allow Target Dashboard to automatically retrieve updates in your data from a file in kept in Dropbox. If you have your website and web advertising stats in Google Analytics, it’s a simple matter to connect Target Dashboard to Google and retrieve all your stats automatically on a daily, weekly or monthly basis. This function can also be found on the “Add New Table” screen. You will need to connect Target Dashboard to your Google account, much like you do with Dropbox. You will then be able to chart your Google stat in a dashboard, and see your charts and dashboard items change as Target Dashboard pulls in new data from Google. As always, if you would like more information on any of the above, or if you have any questions for us here at Target Dashboard, don’t hesitate to contact us on support@targetdashboard.com.